The number of students issued suspensions in U.S. schools continues to be extremely high, resulting in thousands of students missing school every day. Simultaneously,disparities in school suspension continue to worsen, indicating that students in some groups are missing school far more often and disproportionately(particularly, boys, African American students, students with disabilities, and in some regions, Latino and American Indian students). These disparities are also true of referrals to law enforcement and school-based arrests nationwide. According to recent data collected by the Department of Education's Office for Civil Rights, students of color made up 75% of referrals to law enforcement and 79% of schoolbased arrests, even while students of color comprise 39% of the nation's public school population. Punitive school discipline matters tremendously to the educational opportunity of young people: New knowledge on school discipline shows that even a single suspension or a single referral to the juvenile court system increases the odds of low achievement and dropping out of school altogether. 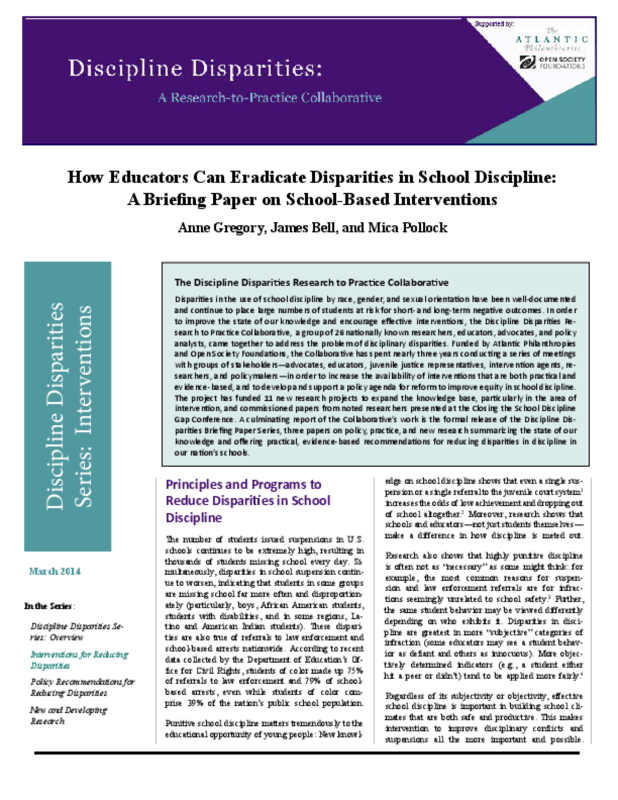 Moreover, research shows that schools and educators -- not just students themselves -- make a difference in how discipline is meted out. Copyright 2014 Trustees of Indiana University.